In December 1981 a meeting was convened at Lake Parramatta by like minded P76 enthusiasts to see if there was enough interest to start a club. The Leyland P76 Owners Club Inc was started in early 1982 and was the first P76 based club in Australia. By ‘82 Leyland had disappeared and morphed into JRA and the initial one hundred plus members had lofty ideals of lobbying JRA for an ongoing supply of parts, swap ideas and share technical information. In its heyday in the late ‘80s there were over two hundred and fifty members and since then new P76 clubs have been established in the ACT, a NSW country club and a second club in Sydney. There are currently twenty-five active memberships, including both family and individuals. Amongst the current members are a number of people who were involved with Leyland back in the 70s and who have vast knowledge and experience with the cars. 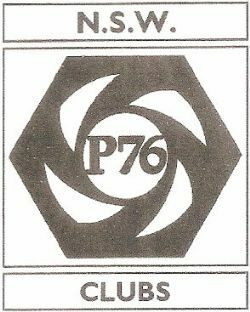 There are also a couple of members who have stripped, repaired and restored numerous P76s and are happy to share their experiences with other enthusiasts. The club has around six social runs a year and joins other clubs for outings. Every two years there is a National Meet – there was one in Geelong this year over Easter. Members are involved in planning the 2010 Nationals, which will be held in the Hunter Valley, NSW. The current club president, Steve Maher has been in the role for the last four years and with the committee they oversee a number of meetings, activities and a bi monthly newsletter. Membership fees are forty dollars a year for either an individual or family membership. The club has an informative local website and there is a national website for enthusiasts around Australia. If you are interested in joining the club you can check out their website which includes the contact details for the committee.